Our little trailer now has a name! In keeping with the "freakin' light" theme, it's the "Lite House"
After a brief hiatus to go run off to the trade show this trailer was supposed to attend (but didn't), here's more photos! Here's a photo of gooping together the roof panel and the end curves with epoxy putty. The little round things are fender washers - I'm using thumbscrews & wingnuts to clamp the panels into alignment. After filleting the joint between the side panel and the roof I pressed fiberglass tape into the wet fillet and epoxied the tape to the roof and side. Here's what it looks like when it's taped. Getting ready to fillet and tape the driver's side - the support in the middle is to keep the walls parallel. If you don't keep the walls parallel in this stage you'll end up with funny angles in the joints and odd stresses later. This is when the upper shell was set down onto the floor. It overhangs the floor on all four sides, and is adhered with putty, fillets, and tape all 'round the inside. Filleting and taping the rear joint. It's a big honeycomb box, all ready for an outer skin! At this point it's light enough to easily move around and turn over by myself. It gets a bit heavier from here. I bet you got pretty buzzed working with resin inside that "box". Pretty interesting stuff you have going there. Here's my pretty lass squeegeeing epoxy into the weave of 12oz. tight-weave cloth. 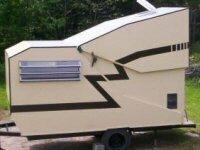 The cloth extends over the side of the trailer by an inch on either side, and past the points of the front and rear curves by about four inches. These are the "frame" rails. I wanted to spread the forces at the axle support point further under the galley, battery, and cargo loads, so I designed in a 3"x1/4" "L" angle of pultruded fiberglass to be bonded 5 ft. along the floor/sidewall joint. It may be overkill, but I like it. It will also make a convenient hard point to attach wiring runs, etc. This is the passenger side of the "A" Frame tongue bonded to the floor and the front of the rail. I give full credit to Andrew for pointing me in this direction with his "Superleggera" design - thank you!! Those with sharp eyes may notice a couple screws at the left end of the tongue extrusion - those are 1/4" machine screws tapped into the frame rail and used to "locate" and clamp that end of the tongue section. While the tongue was being installed, my lass was gooping and clamping hatch doublers. The walls are 1/2" thick, which means that most things made for RV use need backing plates to fit. These are 1/2" plates made of foamed PVC sheet and cut to exactly fit the doors I bought from Vintage Technologies. Back to the bottom - this is a photo of the tongue bonded in place and the axle sited with the mounting holes drilled. And the 1/4" aluminum backing plate for the axle. The section the plate sits on is as follows: 6oz. tape, 3.5oz. skin, 17oz. biax, 1-1/2" honeycomb, 12oz. skin, and 1/4" fiberglass angle. I haven't potted the holes with thickened epoxy yet - does anyone think I need to? With apologies to the Muppet "Sweetums" - "Jack not name, Jack job!" Well what do you know? The door fits!! Anyone see any problems with this design? (I really hope not!!) I had two options here - do a complicated 2 into 1 with twice as many joints and no continuity of fiber back from the coupler to the trailer, or this, which only involved one precision bevel and a couple plates of homemade G10 , and gives both a continuous run of fiber and a nice box to run the wiring in. Almost ready to go camping!! StandUpGuy wrote: I bet you got pretty buzzed working with resin inside that "box". Actually, the epoxy doesn't outgas stuff that makes you high like polyester resin does, so it's a more insidious way of poisoning yourself - I really should be wearing a breather or an organics cartridge filter, but it's too bloody hot. Right now it's raining, too, so I could take some time and update the journal. Only one more resin session and it's time to install lighting, doors, and fan! That's looking really good. Fantastic job and ideas. I like the idea of holding the panels with fender washers. I'd often wondered how to do this with composite panels coz you can't just screw them together like ply. How did you prepare the panels to take the epoxy? Do they have a gloss coating and are the ends 'open'? Did you have to sand them or is the surface ok as is? Did you just 'glass the top for extra stregnth or had you not laminated this panel before assembly? I'm really interested in how you doing all this as I would like to build in composite panels one day myself. PS - Wear a mask... always!!! Mixing, using, sanding... always!!! Trust me on this!!! What is there for suspension on this trailer? Thomcat316 wrote: Anyone see any problems with this design? (I really hope not!!) I had two options here - do a complicated 2 into 1 with twice as many joints and no continuity of fiber back from the coupler to the trailer, or this, which only involved one precision bevel and a couple plates of homemade G10 , and gives both a continuous run of fiber and a nice box to run the wiring in. Your tongue design is different but as long the ball is on the center line of the trailer it should work fine I'd think (which it appears to be in the pic). You don't have enough weight to worry much about side stress lol. I look forward to seeing more of your work. This is a great example of what can be done. Looking forward to seeing the completion. Heifer Boy wrote: I like the idea of holding the panels with fender washers. I'd often wondered how to do this with composite panels coz you can't just screw them together like ply. It's one way of many - you could use strips of plywood with tape or poly film on them, or Starboard, or.... The list is long. I just used the screws because it's what I had laying around. They need to be removed as soon as the putty kicks so the gaps can be filled in. Next one I do I'm probably going to use Starboard strips so I don't have to sand bulging putty off the roof. How did you prepare the panels to take the epoxy? Do they have a gloss coating and are the ends 'open'? Did you have to sand them or is the surface ok as is? Did you just 'glass the top for extra strength or had you not laminated this panel before assembly? The panels are polyester honeycomb with a non-woven scrim heat-bonded to the ends of the cells. Think of it as end-grain wood core. The surface is better than ideal for bonding face laminates to, and you're not limited to woven reinforcements - the interior might get some panels made up with Formica both sides as cabinet material, haven't decided yet. The central roof panel was cut out and the fan opening was fitted before it was pre-skinned with 9 oz. 'glass, then it was fitted into the curves and fixed in place with putty. All panels were fiberglassed on the interior surface prior to assembly - only the central roof panel and the side panels were 'glassed both sides. StandUpGuy wrote: What is there for suspension on this trailer? Dexter #8 torsion axle, rated at 800 lbs. - the trailer needs capacity for cargo. The next one is going to be rated at 600 lbs. Last edited by vtx1029 on Mon Jun 27, 2011 9:18 am, edited 1 time in total. So - Am I to understand that the "frame rails and the angle are all extruded fiberglass?? starleen2 wrote: So - Am I to understand that the "frame rails and the angle are all extruded fiberglass?? Yup - 2"x2" square tubing with 1/4" thick walls, and 3"x3" "L" angle with 1/4" thick legs. Without any miles on it yet it seems pretty robust. I bonded the tubing to the floor of the trailer for more than half of its length, as well as bonding the ends to the rails, and bonded the rails over the corners for their full (5 ft.) length. There's some vertical flex, but not more than I get with my boat trailer. There's no detectable horizontal flex. This is one of the most unique and intriguing approaches to building a teardrop that I've seen.